WataugaWatch: Keep It Up, Duchess! Also, I'd like to know more about George Soros and his activities and leftist allies. And yes, I'd like to know more about the fascists and their allies and activities. The rich multi-billionaire set is funding both sides, left and right. Why would Ann Romney want to kiss Obama? Ah, there's the false equivalency yet again. There is no way that the "left" and "right" are equal on this one! George Soros yada yada. I am SOOOO tired of hearing about Soros every time any Dem makes a comment about how much $ the rich are shoveling into politics. You can Google it: he's given $2 million, mostly to organizing and voter advocacy groups. Meanwhile Sheldon Adelson, the Las Vegas casino owner and down the line pro-Israel hawk, whose $5 million was not enough to buy Newt the nomination, has already given an additional $20M to Restore our Future, the conservative superPAC. So far conservative billionaire$ are out-spending the liberal ones at least 10 to 1. And Rmoney hasn't even tapped his own vast fortune yet(that we know of). Let least we know who Obama's donors are Anon. which is more then we can say for Mitt I won't disclose my bundlers Romney. Unlike Mitt running against myself as I appointed Bundlers to staff positions while gov Romney. What's he got to hide still? JW needs to get a real job and he would have a different view. Most all of his income has come from the table of the taxpayers. Anon 7:41, you say "JW needs to get a real job and he would have a different view. Most all of his income has come from the table of the taxpayers." Curious, this statement is even MORE true for Virginia Foxx. State universities get only part of their funding from the state (less and less each year) but we pay politicians' entire salaries. So would you also say that Foxx doesn't have a "real job", or do you have different rules for the people you agree with? Also, in the same interview, did you catch her holier-than-thou bragging about how Mitt didn't take a salary while he was MA governor? As if being so wealthy that you can live for 4 years off your investments makes you better than someone who relies on being paid for his work. The ultra-rich often lose touch with what life is like for most of us. I don't like the thought of this woman becoming First Lady. These people just astound me... I don't understand them! How much money does one person need in a year anyway? If I made 150,000 in a year, I'd think I was rich. Romney made 21 million dollars last year... that's 140 times as much as my dream salary of 150K. I can't wrap my head around that much money. Why do you people think you have a right to tell someone else how successful they can be? Envy? Jealousy? The better question, Anon, is why you feel the need to defend these extremely wealthy people. I assume that you're not rich, like most of us here. Why do YOU feel the need to defend the extremely wealthy? 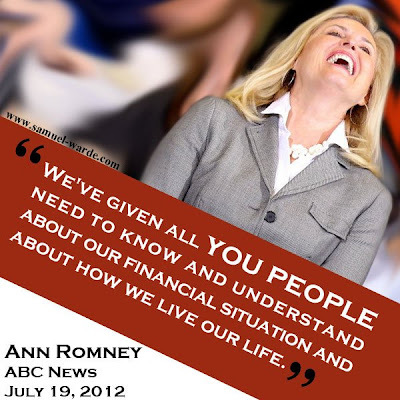 They're laughing at you as they put away more and more money. They already have more money than they know what to do with, and the Republicans want to give them more and more. Where's the "shared sacrifice" that we all hear so much about?